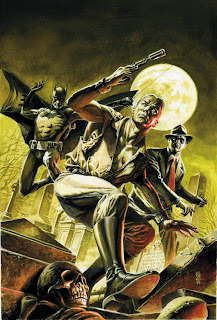 Hot on the heels of Batman/ Doc Savage, DC's Source blog has released the cover to FIRST WAVE #1 - featuring the Doc, Bats and The Spirit, by JG Jones. A sensational image in itself, there's a hidden 'Easter Egg' for those who zoom in to read the tombstone inscription... 'Here lies the mortal remains of the once fi(obscured) career of JG Jones'. A tongue-in-cheek play on the fact that Jones, despite his best efforts, was pulled off DC's last 'event' title Final Crisis at issue 6 and replaced by Doug Mahnke in issue 7 - in order to meet production deadlines. JG, who always has needed a little more time than most to produce his iconic work, at the time issued a public apology to his “three or four remaining fans” and thanked them for picking up his work. 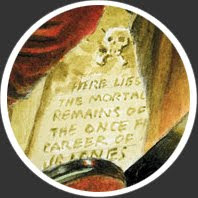 While Jones was both pencilling AND inking Final Crisis, the switch divided fans - half blaming DC editorial for not being able to ensure all the trains ran on time, few arguing sometimes things happen behind the scenes beyond anyone's control, and others screaming for Jones's blood, at not being able to deliver on-time in an industry built on monthly deadlines - hence the Tombstone. Me - I'm glad to see him back and that he hasn't let the crisis of Crisis affect his sense of humour. Talent always rises, and as shown by this awesome cover, the man sure can draw.